Marketing reports for May 2018 including Mary Meeker’s 2018 Internet Trends Report; the economics of AI, the branding economy; the state of social; content trends; podcasting growth; and many more reports. 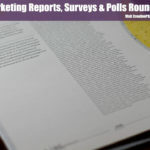 Marketing reports for April 2018 including employment screening benchmarks; best and worst customer experience ratings; breaking a traffic plateau; B2B video; music industry revenues; podcast consumers; influencer marketers; Twitter bots; emoji click-through-rates; and many more reports. Marketing reports for March 2018 including GDPR data; a massive report about fake news; voice search opportunities; BuzzSumo’s content trends report; Pew Internet’s social media use report; Google AdWords benchmarks; Facebook advertising research; and many more reports. Marketing reports for February 2018 including the coming General Data Protection Regulation apocalypse; AI-powered marketing; 2018 content trends; advertising budgets; the state of chatbots; and many more reports. Marketing reports for January 2018 including Edelman’s Trust Barometer; creative trends; Business Insider’s Influencer Marketing Report; the State of Video Marketing Report; Marketers’ Top SEO Priorities; and many more reports. Marketing reports for December 2017 including BuzzSumo’s Most Shared Facebook Content report; Google’s 2017 In Search; Nieman Lab’s 2018 Predictions For Journalism; and many more reports. Marketing reports for November 2017 including Pew’s research on attitudes toward automation; the SEMRush Search Rankings Report; the Knight Foundation’s examination of engaged podcast listeners; and many more. Marketing reports for October 2017 including Gallup’s survey of American sports fans; Pew Internet’s trends in social and digital news media; Return Path’s Delivery Benchmark Report; and many more. Marketing reports for September 2017 including Pew Internet’s News on Social report; Forrester’s holiday sales projection; and many more. Marketing reports for August 2017 include Pew Internet’s Fate of Online Trust report; BuzzSumo’s Facebook Video Engagement report; and many more.